In addition to concrete polishing, we specialize in application of specialized coatings to solve concrete flooring issues. Each coating provides a specific purpose. Self Leveling concrete is a unique cementitious coating that can be applied at ¼ inch thick to thicknesses exceeding 1 inch. They are perfect for floors that are uneven, damaged or have height issues at doorways or adjacent flooring such as tile or hardwood. Thickness of self levers can be adjusted to almost 100% of the height desired. They come in white or gray and cure to a smooth even surface. Self leveling concrete can be used as a wear and decorative surface for resurfacing virtually any concrete surface. They can be dyed or integrally colored making them ideal for industrial, retail or residential floors. Saw cuts can be in any size and shape to enhance your interior design. They can sealed and protected with numerous coatings to protect the floor for long term performance and simple maintenance. We have applied self leveling concrete in luxury residential homes, apartments, retail stores, restaurants and a variety of industrial buildings including high traffic loading docks. Frequently referred to as a skim coat or microtopping, these are thin, high performance cementitious coatings applied at a thickness of 1/8 inch or less. Whereas a self leveling concrete is applied in one coat, micro toppings are typically applied in 2-3 coats. The process starts with a liquid primer followed by a heavy first coating. The second coating is frequently a finer version or in some cases a super fine coat is applied. They can be applied by trowel, gauge rake or sprayed on. Micro toppings are extremely durable and impact resistant. They are suitable as a resurfacing solution for damaged concrete flooring or when height is an issue at doorways, floor drains or to match adjacent flooring like carpet, tile or hardwood. Decorative options are unlimited. Coatings can be integrally colored or topically dyed. Saw cuts or engraving can customize the floor in unlimited designs. Floors can be sealed with water based products, solvent or epoxies. Epoxy and polyurea coatings are high performance industrial concrete toppings. Thickness is measured in mils and typically about 1/8 inch thick. Depending on product used, floors need to be mechanically shot blasted or ground to open the pores of the surface increasing adhesion. They come in clear coats or pigmented. 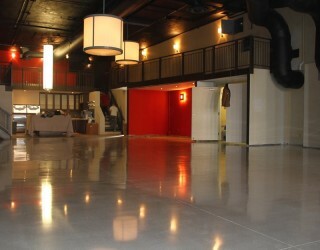 Floors can be ground, stained and coated. They can also be pigmented with decorative chips or colored quartz. Coatings come in a variety of blends. Some are very inexpensive, low impact paints. Others are a combination of high performance materials requiring technical expertise to apply with the proper equipment and application systems. New technology coatings have developed unique characteristics with long term non slip performance and bacteria prevention. Each coating has a specific use. Self Leveling Concrete and Overlays – Which Option To Choose? 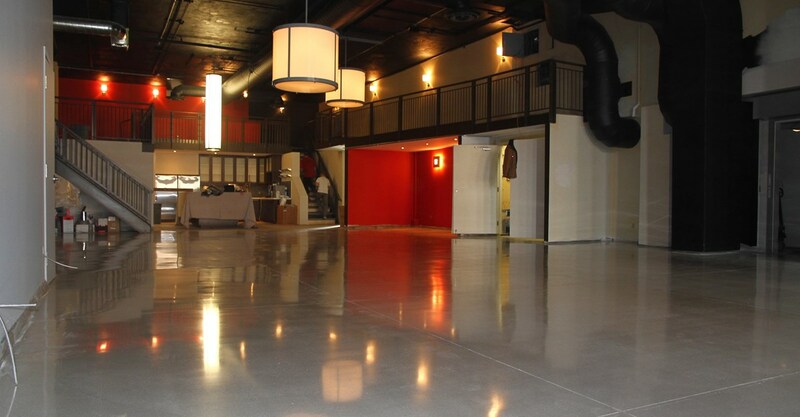 We work with architects, engineering professionals, property owners and tenants to provide the right system whether being polished concrete, a specialty coating or a customized combination. Price, time, function and decorative options are all considered.